By the time I returned home from work last night 4 healthy ducklings had arrived, to our excitement. These were moved from the incubator to the brooder box this morning with the nine 3 day old chicks- with a mixed reception. The first duckling was amusing- I dipped its beak in the water, placed it down. The chicks were making a noise and scuttling around, due to my appearance. The duckling responded to the chirping and waddled up to them... all of which gathered in the furthest corner. Each other duckling then in turn, waddled up to its sibling and chirped, and then again to the cowering group. I must admit, I had, had reservations about introducing the day old ducklings to the slightly older chicks, as although we have them cohabiting as adults. They would (temporarily) outnumbered and birds can be pretty brutal! But their confidence put me at ease (though I did check on them quite a few times, before making my way to work this morning). In fairness as long as they have sufficient food and room they should be fine. Our adults cohabit quite contently, most of the time the ducks seem quite oblivious to the chickens. And the babies, although initially more curious, did not appear bothered by the lack of response and continued to waddle about and explore their new environment. Hopefully we get to boost their numbering this evening and/or tomorrow, making the odds a little more even. 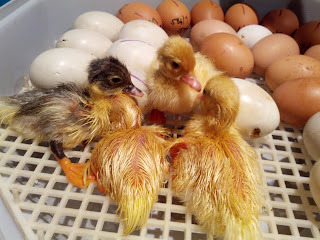 As for the remaining hatchlings we have 3 drying off in the incubator, two on the way and one no longer with us. 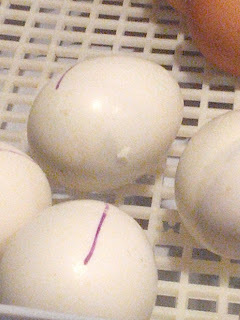 So to date we have 7 from the initial 20 eggs, although only 14 were fertile when we candled them. We do have 2 of the remaining eggs that have “pipped” and I am hopeful they will successfully hatch. “Pipping” is the term for the bird breaking into the air sac for the “internal pip”- at this stage you may see the egg move slightly, hear chirps or a tapping on the shell. Then the bird will break an area of the shell with its beak for the “external pip”, before they eventually pop an end off the egg to make their big entrance. Unfortunately there are 4 eggs that we hold no hope for. One had “internally pipped” but that was Sunday… and it’s stopped moving too. The others we’ve not seen any movement or heard any sound from. Which is sad as they were fertile and developing when we had candled them. What was more upsetting, especially for me this morning- was we had one little one hatched but wasn’t so healthy and as a result (by my hand) is no longer with us. This I will explain if you chose to read on. As I guess this is the reality of this “farming” or “smallholding” life, but is not something I did lightly and may not be for the sensitive. This little duckling had hatched but had its stomach (intestines etc) on the wrong side of its belly button. Yes birds have belly buttons; they have an umbilical sac that is sometimes attached when hatching, that they absorb. This is the last of the nutrients from the egg. It’s quite amazing, really. However the sac is a yellowy- brown colour and quite gooey, which will eventually dry up and drop off. This was not. It was clearly not right, and what most alarming was the little one was losing blood from it and was unable to coordinate itself and was very weak. And yes their all initially weak on hatching, it’s a big process- but this was different. So, as upsetting as it was I could not leave it all day, to suffer and die a slowly, just because I didn’t want to have to do it. Now I’ve never actually done this part myself, so it was not an easy decision. And not one I took lightly, but as I said I guess it is a reality that we face. And a decision I did not want to, but had to make. Now some may read this and think get over it, others maybe horrified, but I guess the major thing I struggled with, was although we rear animals for the plate. I reconcile it with the knowledge they had a good life, for which we are responsible. This little one didn’t even get that. Now not to be all doom and gloom I guess what I need to focus on is that we have 7 healthy ducklings and the hope and excitement the possible arrival of a few more… so fingers crossed.